Happy Friday! It's finally peach season! So far though, I've been more impressed with the plums I've had this summer than I've been with any other kind of fruit. Every summer there seems to be a certain fruit that has a magic summer - about ten years ago, there was a raspberry season that I've never forgotten - they tasted like candy they were so sweet. Some years the blueberries are amazing. 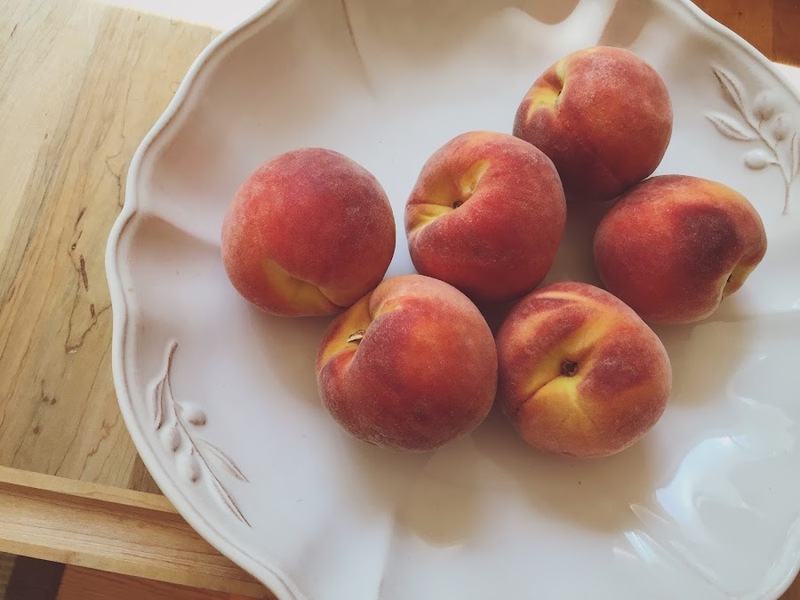 Every so often the peaches are just unbelievable, but when that happens, we just eat them standing over the kitchen sink and never feel like we can bake them into anything, because that would be a waste, not to eat them plain, out of hand. When the peaches are a little more on the lackluster side, then I feel like it's ok to make them into a cobbler or a galette. Long ago, I made little peach hand pies and then lost track of the recipe, but I think this might be similar to the recipe I lost. 'The Sea House' - sounds right up my alley. Love this idea about family portraits. I will totally 100% read this book. Zipit bags seem to be all the rage amongst Julia's pals - the pencil case unzips into a jump rope! Oh happy day - Inside a Black Apple (Emily Martin) is on Instagram now. Cute list - what to buy a 4 year old. This was a hilarious read! Thanks to my friend Amanda for putting this on my radar. Cool Book of the Week: 'Fairy Tales' by E. E. Cummings. Did you know? Have you read? I have not on either count. I JUST found out yesterday that this exists and I thought you should know about it as well, if you didn't already. There are four tales in this lovely looking book, and people have described the stories as charming and sweet and clever and non-violent and...fairy tales that just make you happy! The titles include: 'The House that Ate Mosquito Pie', 'The Elephant and the Butterfly', 'The Little Girl Named I' and 'The Old Man Who Said Why'. E. E. Cummings wrote these stories to entertain his daughter when she was small. I've read that it's also well worth seeking out a used copy of editions that contain the original art of John Eaton. Have a lovely weekend! It's supposed to be rainy here - it rained hard for about 15 minutes the other day and it was the most beautiful sound. I had forgotten what a hard rain sounded like! I put on long pants for the first time in three months. As a college student I liked e. e. Cummings poetry. Makes me curious about this one for kids. I have internet again! I can read your posts! I've missed your words so much. Cheeehoooo! My family has had a running commentary this summer as to what the absolute best fruit is, and I'm currently on the fence between plums and raspberries. Depending on what I'm eating that day. aaaaah my sweet Amelie, I've missed you soooooooo! didn't realize you were off the grid ha ha ha. Hope the house is coming along awesomely!! ha ha ha, so we're not the only ones judging away on the fruits - yah this summer here it's definitely the plums. The e.e. cummings book sounds so interesting! We did finally get around to checking out the recent picture book biography about cummings, Enormous Smallness. The poetry-loving husband read it with the girls, though. I can say the illustrations were nice, but I didn't read it. I bought two peaches the other day, and we forgot about them. We are terrible produce buyers sometimes. We had good cherries, earlier this summer?